You can safely say there’s literally no competition. But if you think about it, that’s just another testament to the series’ dedication. Whereas some series might regress and become stale without any rivals, Fight Night, like a boxer thirsty to add another punch to his arsenal, forges on and tries to polish things further. Fight Night Champion sees the series in peak fighting form. Akin to NBA 2K11’s Michael Jordan intro, Fight Night Champion throws you right into the action as Andre Bishop, a fictional boxer and the star of the game’s story-driven Champion Mode. You’re pit against a fellow prison brute, where you’ll be introduced to the feel and the mechanics of the controls. After that fight, you’ll be given the choice to continue with Bishop’s tale, or access the game’s other modes lifted from previous Fight Night games. Before we get to those though, let’s dive into Champion Mode a little more. The story doesn’t attack from an unfamiliar angle. It’s a simple tale of a boxer rising from the ranks, and on the way to the top, he’ll meet characters that are sure to be familiar to anyone who’s watched a boxing film. There’s the tough-as-nails trainer, the crooked referee, the menacing ultimate rival, the underhanded promoter, they’re all here. The presentation though is topnotch, from the voice acting, to the writing—enough so that you’ll actually care about your boxer. The story, while elementary in content, allows for a dynamic experience that should keep you on your toes. There will be fights where you’re handicapped with a broken fist or a cut above your eye, and some where the referee is trying to get you to lose. It’s as detailed a story mode as we’ve seen from a sports game. The action on the ring is faster this time around, as it’s easier to throw punches. Unlike the previous Fight Night, which required more complicated analog stick movements to throw different punches, Champion simplifies things. The stick movements needed now are no more than just simple flicks towards one direction, making it less likely to throw an unintended punch. At first, it will seem that the fighting has become too diluted, too easy. But as you go further along, and as you raise the difficulty, the simpler punching mechanics allow you to focus on other areas including defending, bobbing, weaving and countering. These skills will be vital, especially when facing experienced players in the game’s online mode. The fights look incredibly lifelike, with the game’s improved graphics. The way punches disfigure faces look painfully satisfying, and it’s a whole lot bloodier too. Legacy Mode, the game’s career mode, returns. In this mode, you’ll create a boxer, from how he looks to the way he fights. You carefully choose your opponent, and ultimately, try to become the champion. There’s an unpredictability to the fights, even when you’ve chosen an opponent who you think you have an advantage over. One-hit KO’s do happen in the game, and one, perfectly-timed punch can really change the course of an otherwise, lopsided match. Like Champion Mode, Legacy Mode is very addicting for its dynamic feel. 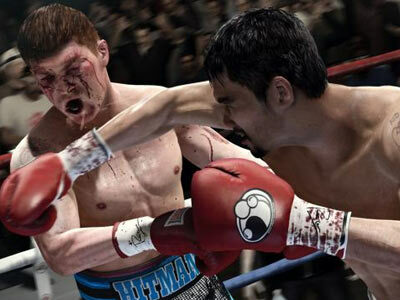 Fight Night Champion features 55 licensed boxers including Pacquiao, and Donaire. Other highlights include Ali, Tyson, Frazier, Sugar Ray Robinson, Foreman, Cotto, de la Hoya, and Roy Jones Jr. Unfortunately, Floyd Mayweather Jr. isn’t it, so even in our game fantasies, Pacquiao-Mayweather still won’t be happening.